This triple layer orange layer cake is made from scratch. Tangy, rich cake layers are separated by thick layers of whipped orange frosting. This old-fashioned cake recipe is just right for any occasion. As you are reading this, as long as you are reading it on the day it was published, I am flying across the Atlantic ocean on my way to France for a 10 day vacation with my husband. We’re spending a couple of days in Paris then heading in a circle around the country and back to Paris before flying home via England. Yeah, we’ll only be changing planes in England but technically I’ll be there, right? I am beyond excited! This is the first vacation my husband and I have had alone in several years. We’ve had a couple of family vacations and I do love them… but Paris? With the man of my dreams? While I’m gone I’ve scheduled several posts and Debbie from Made From Pineterest and Jennifer from Take Two Tapas will both be helping me out so be sure to check back often! Also, do me a favor and share on social media because I am not sure when I’ll have WIFI and can do it. Thanks! I know I’ve been posting a lot of cake recipes lately but sometimes my life is like that. We have a lot of Spring birthdays in our family thus we tend to eat a lot of cake this time of year. Terrible timing when you think about it — just before bathing suit season. Honestly I ended up making this layer cake because of the Coconut and Nutella Cake that I made for Made From Pinterest last month. That cake called for egg whites so that left me with egg yolks. The only logical thing to do was to make another cake, right? So, I looked through my various cookbooks and found an orange cake. A few adaptions later I had this, which I think is a pretty awesome cake. The whipped orange frosting is so light and fluffy and the cake has the most tender crumb ever because of the egg yolks. I put it on thick and swirled it the old-fashioned way. I know that’s not so popular now but I still love how approachable it makes the cake. Like the cake is sitting there just begging you to drag your finger through the frosting and give it a taste. Good cake pans are a must. I love these heavy, high sided cake pans from Wilton. The Mio orange-tangerine water enhancer is one of the reasons the frosting has so much flavor without losing its fluffy texture. 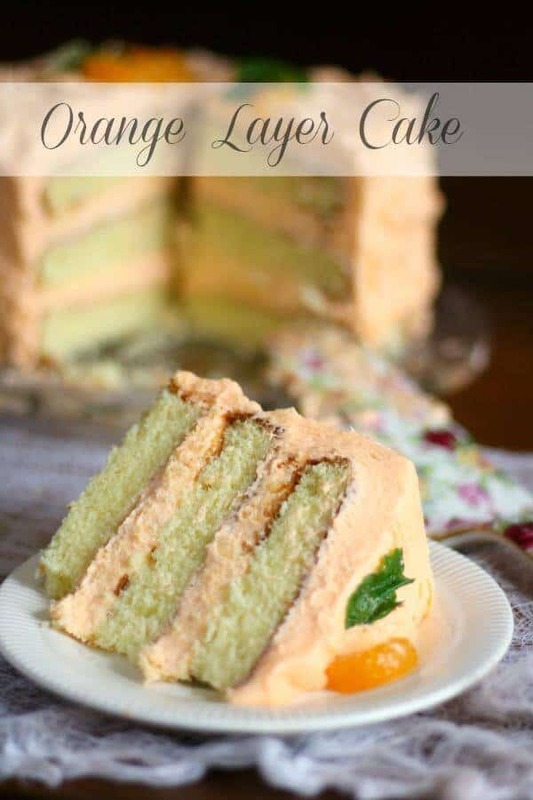 Here’s the orange layer cake recipe. Find a reason to make it soon! This cake is a show-stopper. 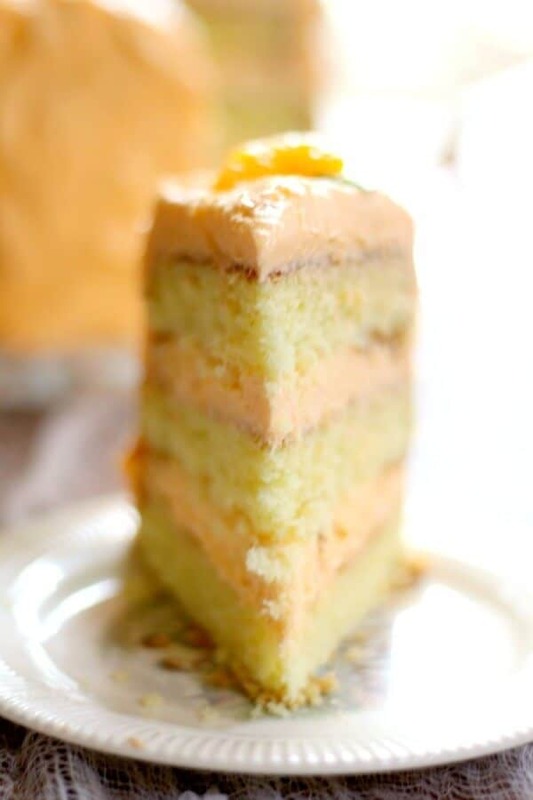 Three layers of moist orange cake with a tangy whipped orange frosting between each layer. There's so much fresh flavor it's unbelievable! Beat the egg yolks until they are light, thick, and lemon colored and form a ribbon when you pull the beaters out. Add the sugar gradually and beat until light and fluffy - 5 minutes on high. Mix the milk, orange juice, vanilla, and orange zest. Add the flour alternately with the milk mixture beating thoroughly after each addition. Bake for 20 - 30 minutes or until cake tests done. Turn out carefully to cool completely. Add 2 cups Confectioner's sugar and the water enhancer. Add 1 cup of the sugar at a time, beating well after each addition. With mixer on high speed add the cream slowly and whip for 3 to 5 minutes, or until thick and creamy. I made this cake today it came out perfect and very tasty.The cake cooked in ten minutes. It was a good thing I was paying close attention to the oven. I used fresh oranges all the way. However I cut the frosting to a quarter of the recipe. I found the full amount is way too much butter and sugar to consume. I also used orange flavoring the result was a delicious frosting. wow, 10 minutes? That’s crazy! So glad you were watching! Can I use real tangerine juice instead of the water enhancer? You can but it won’t have as much flavor. The water enhancer is concentrated flavor… to get that much with juice will throw off the ratios. 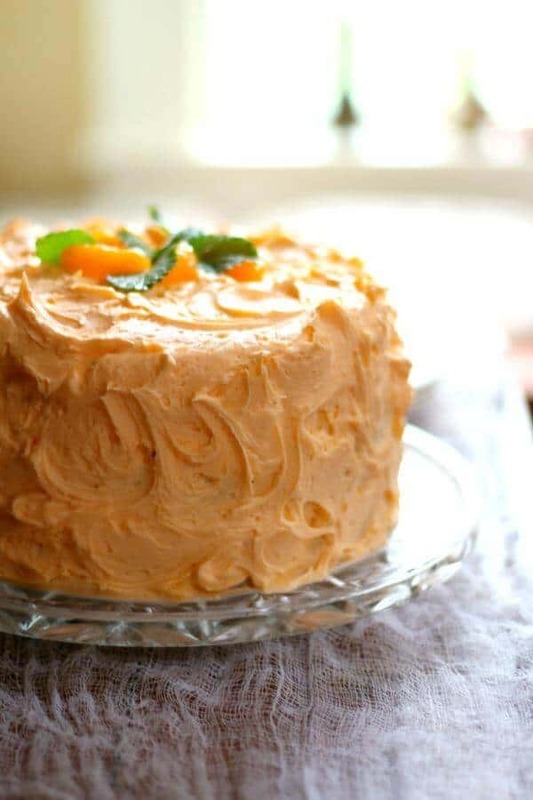 I’m making this beautiful Orange cake for my husband’s birthday this Tuesday. Instructions say to set aside the beaten egg yolks, but then doesn’t mention when to add to the mix again. I assume when blending the dry ingredients to the milk ingredients? Thank you Susan! I am so glad you brought this to my attention. You add the egg yolks to the butter and sugar before adding the milk mixture. I’ve fixed it in the recipe. Be sure to let me know what you think… and post an image to the Restless Chipotle Facebook page! This cake is so pretty! That frosting is calling my name! What a gorgeous cake! I am in love with all those layers! Enjoy your vacation! Thank you so much! It is very rich, but so good! Quick question regarding this lovely orange cake; would buttermilk make for a more tender crumb, or would it not work in this recipe?